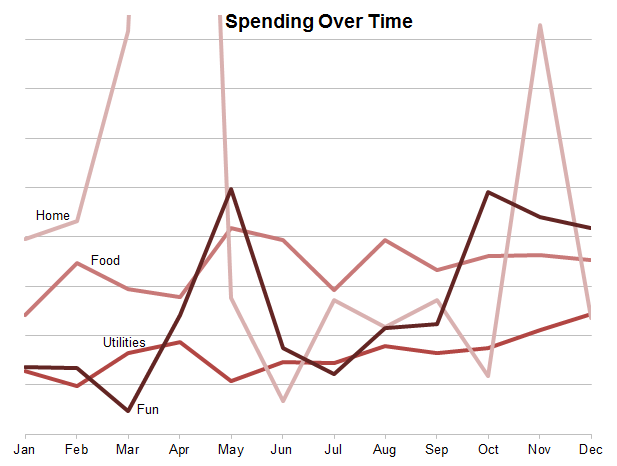 I was once again reviewing our finances for the year and wanted to share my findings. I know for me, I struggle to find information on what's "normal" to be spending... or maybe "not normal" in our case. So hopefully this helps shed some light on what one other family is doing. For starters, we track everything using Mint.com and then I copy everything over to a spreadsheet once a month. I like detailed spreadsheets, but if you're not into that, Mint will show you what you need to know to make smart decisions. That's what Jessi looks at along with these charts once a month with me. This first chart is the same as I showed last year, with one difference I'll explain in a bit. The lighter lines are from 2012 for comparison. 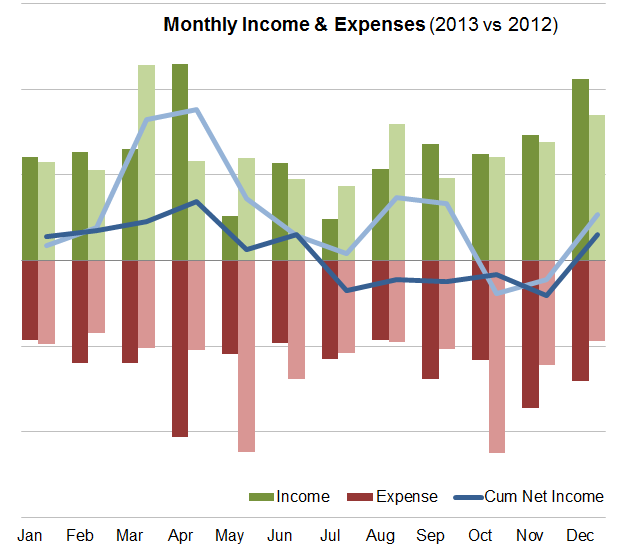 The blue lines are the cumulative net income. So, in a month where our income was high and our expenses were low, the blue line would go up, and that's the starting place of the following month. The one change I made this year was to treat our real estate finances as a separate entity. We even have a separate bank account now that all of that activity is done from. Then whatever the net income was for that property, I added it to our income as a single line. So in May and July we did a bunch of repairs and the "income" from that property was actually negative because we spent more than we collected in rent that month. Also included is the down payment and closing cost of our new home and student loan payments. The goal is to get the blue line just above zero which means we put all our extra money towards paying off loans. As you can see, we had to dip into our savings to pay for the repairs we did. We had savings from previous years, so it was OK. Then in October Jessi got sick and I paid all the doctor bills in November from our Emergency fund. You can kind of see why my goal this year is to not have any large expenses. Here's a new view I created. I wanted to see how we were spending our money and I wanted something in between the detailed line items and the top line. 100% = our take home pay this year (the investment properties net income were included as income). Mortgage = The property we live in. The investment property mortgage payments are separate (embedded in income). When we lived in the duplex I split the mortgage in half. Hopefully you can tell what our priority is. Once our loans are paid off, that'll convert to savings/investing. Also, as a general rule you want your housing mortgage/rent to be no higher than 33% and hopefully below 25%; we're killing it in that category. Our food category seems a little high though. Well... I know it's a little high because we spent $1,500 more this year than last year... mostly eating out. Knowing this will help me stick with my health goals this year. I'll be honest, "Home" is kind of a catch-all category. I would call them "semi-optional" expenses. Buying a place was a large part of that category. Finally, not included here are taxes and my 401K contributions. First, they happen before it gets imported into Mint, so I can't track it easily. Second, I don't have much control over my taxes and I can't really do anything with my 401K balance for a while. The last thing I wanted to look at were some specific spending categories. There are ones that we have some control over and try to keep low. Yes, I realize I cut off the top of the chart, I did that so I could see the other lines. Like I talked about earlier, our spending on food is too high. It looks like the middle of the year is where it got out of hand. It also appears to coincide with our home purchase / fixing the duplex / Vegas trip. So, the underlying issue is that when we get too busy, we opt to eat out more often. We'll need to be more conscious of this going forward. Home spending spiked when we bought our place and again at the end of the year when I fixed a bunch of things. Utilities... look at the steady growth rate... I suppose it's normal to grow in the colder months, but December was $230 higher than January! We'll definitely need to keep an eye on this one. Finally, the Fun spending really seems to spike when we buy plane tickets (May & October), or Disney World tickets (November). Though, the general trend for Fun seems to also be growing. This is another one I'll be watching closely. If I was grading myself, I would probably give us a B. We did good on our loans and mortgage. We blew it on eating out and can probably make some cuts we don't care about in the fun category. The utilities one can probably be curbed by paying more attention to our heating habits (ie, not letting it get too roasty). I feel pretty good about the Home, Giving & Cars categories. 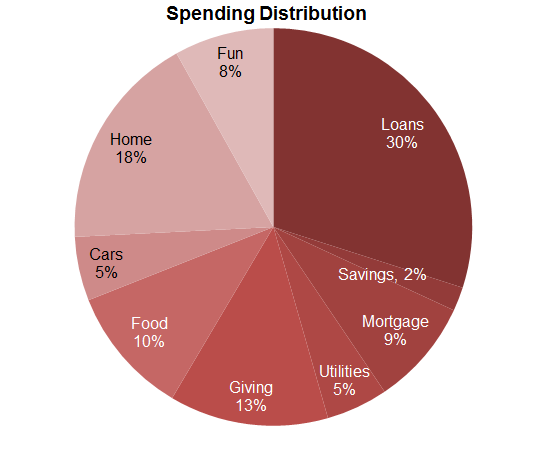 Getting an A next year will require us to not have any large expenses in 2014 and keeping our Food, Fun categories lower.